The pride of the German Merchant Marine at the time moves up the harbour soon after delivery. 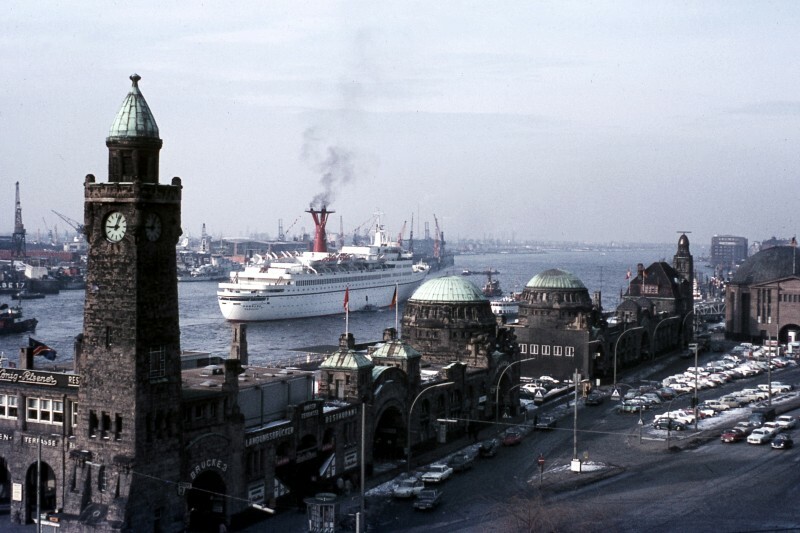 photo taken by Mike Cornwall from window of Youth Hostel at Hamburg in 1969. Sorry my mistake,thought Youth Hostel was a YMCA. Well, my hometown too! And that picture wasn't taken from "YMCA" but from a large balcony in front of the still existing local Youth Hostel. A wonderful old photo of my hometown! Sorry was thinking of an oil rig movie around the same time by More, your right another excellent actor. The movie in 1974 was JUGGERNAUT! And sorry, there was no Roger Moore, but David Hemmings, Richard Harris and Omar Sharif. Very exciting movie, worth to see it several times! The day she was used for a film as the Britannic starring Roger More, I read most of the extras regreted their choice of a sea voyage, the Channel was not in a good mood. This photo was taken on 19th March 1969. From memory it was a trip taking local dignataries out for a days "jolly", prior to entering service. This photo has been shown 1,186 times since it was added to the site.